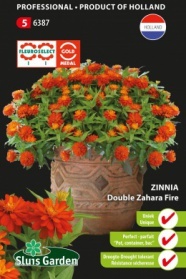 Zinnia double Sahara Fire has already won 2 important prizes: the Fleuroselect Gold Medal and the All-American Selection (AAS). Sahara Fire is an annual and is really completely double flowered. Moreover, very disease resistant and also resistant to drought. The large scarlet red flowers will do fantastic in your garden, but because of its 50 cm height will also certainly do well in a pot. Sow in a warm place and transplant into the garden later for a perfect result. Sahara Fire is a real winner!